South Carolina DUI Attorney Nightlife | South Carolina Personal Injury Attorneys | Criminal Defense Lawyers - Strom Law Firm, L.L.C. Here’s a classic scenario: you’re at a bar or restaurant, you and your friends have some social drinks over many hours. You want to be responsible, though, so you drink slowly, drink water with your alcoholic beverage, and have some food. When you leave the bar, the police are out in force. You are pulled over after driving too slowly, or possibly missing a turn signal. You’re given a Breathalyzer, and the officer finds that you have alcohol in your blood stream, so you’re charged with a DUI. Although too many people get behind the wheel after drinking too much or ingesting illegal drugs, you may not have intended to drive while intoxicated. The Strom Law Firm, with the help of Charleston’s wonderful Midtown Bar & Grill, is offering special wrist bands for those purchasing alcohol. The bands feature contact information for Strom Law Firm DUI Attorney Trey Harrell, who received his law degree from the Charleston School of Law. will be available at Midtown Bar & Grill feature a QR code, which will direct you to the Strom Law Firm’s DUI app, so you can contact a DUI defense attorney, like Trey Harrell, ASAP. 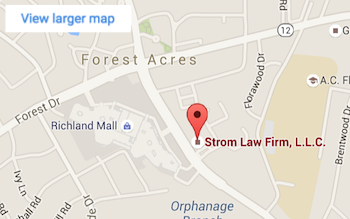 The Strom Law Firm offers free, confidential consultations to discuss the facts of your DUI case, so do not hesitate to contact us! Be responsible and designate a driver!